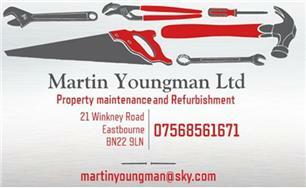 Martin Youngman Ltd - Home Improvements based in Eastbourne, East Sussex. Martin Youngman Ltd is a fully insured, qualified Plumber working in East Sussex. With over 17 years experience in Plumbing, I also have extensive experience in a variety of other trades. I work closely with a range of other tradesmen to ensure that any trades that cannot be completed by myself, can be done so efficiently and conveniently, saving customers from having to conduct their own searches. Over the years I have built up an excellent reputation for reliability, professionalism and competative rates. I am dedicated to ensuring customer satisfaction and offering a broad range of skills to the highest of standards. I strive to complete all work with the minimum disruption at a time to suit you. If you would like to give me a ring I would be more than happy to come and give a free estimate on any works that you need completed. Or pass you on to the relevent tradesman if required.